CaviWipes Surface Disinfectant Wipes are multi-purpose (cleaning, disinfectant, decontaminant) wipes. They are powerful cleaning wipes that eliminate germs, bacteria, and viruses, such as Staphylococcus Aureus, Hepatitis B & C (HBV) (HCV), and Pandemic 2009 H1N1 Influenza A Virus. 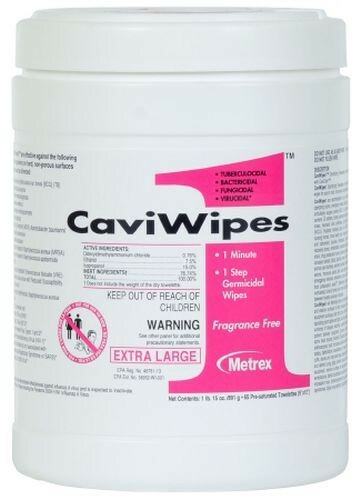 CaviWipes can be used on hard, non-porous surfaces in hospitals, schools, animal care facilities, and much more. They have a one minute kill time, which decreases the risk of cross contamination and allows for faster room turnover. 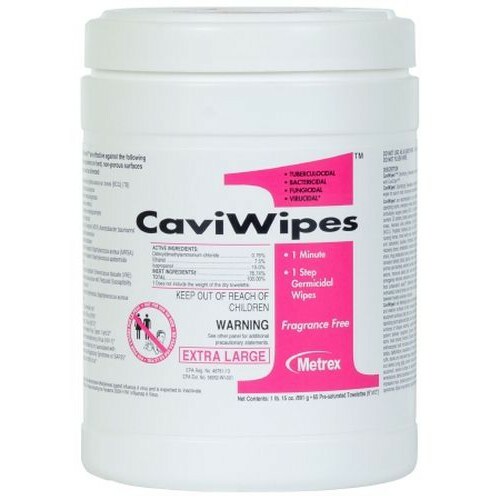 CaviWipes have been the number one surface disinfectant used in healthcare facilities for many years. Cleaning wipes are also available with bleach, such as the Sani-Cloth Disposable Bleach Wipes by Professional Disposables.